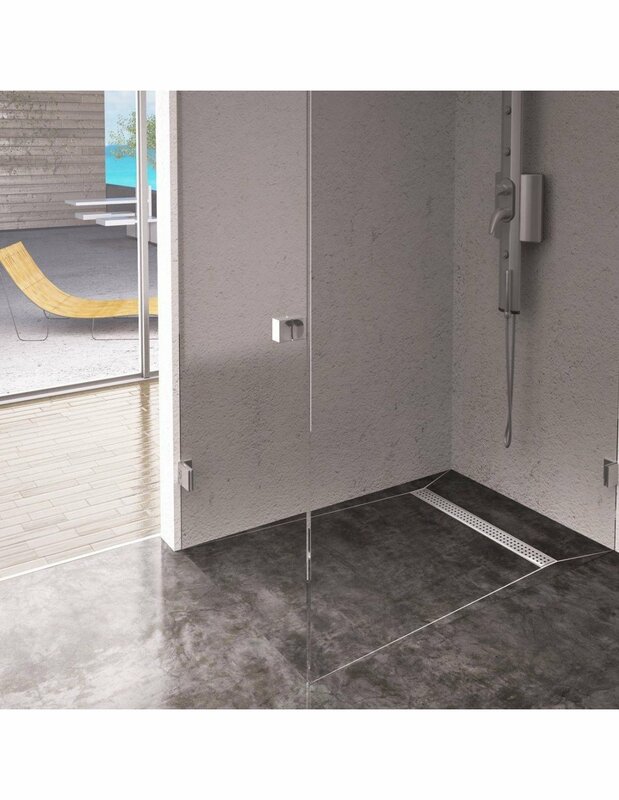 mm is the lowest profile wet room drainage type we can supply. It's total height including waste trap is only 64 mm. 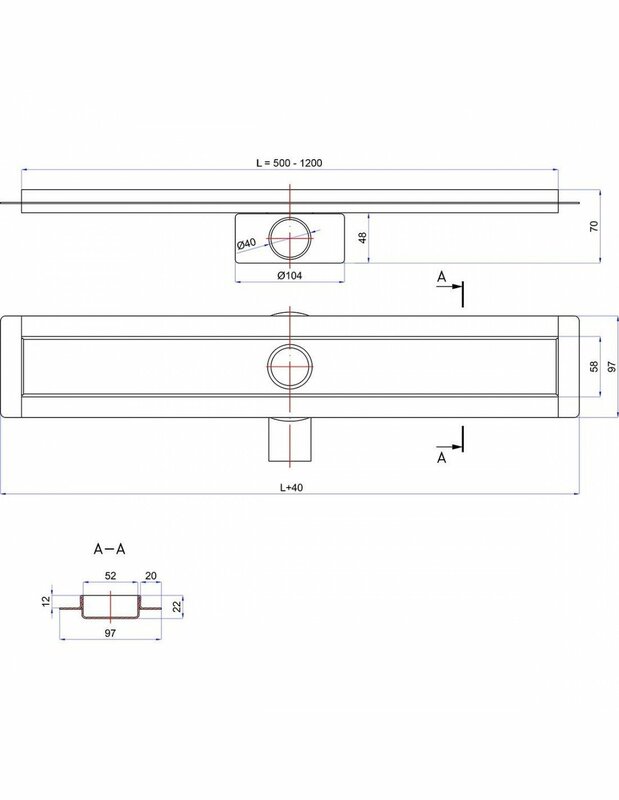 Channel consists of flange and welded vertical frame. 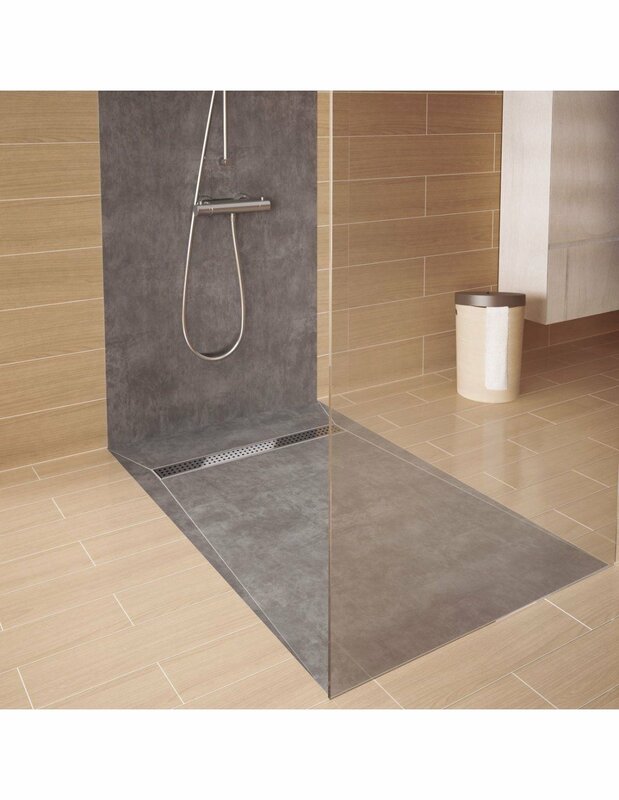 Modern design, slim grating and low space requirements are making it suitable and good looking in almost every shower. High capacity, welded siphon trap is integrated with the drainage. A textile sealing membrane is also included, allowing to achieve waterproof seal very easily. 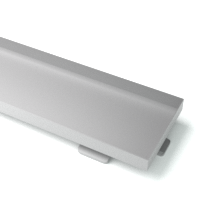 Premium Slim drain channel is 58 mm wide. Frame is 12 mm high so is maximum thickness for finish material plus adhesive. It has Sirocco grate included, which is patterned with two rows of squares parallel to the channel edges. They allows water to flow, look elegant and are very practical at the same time. 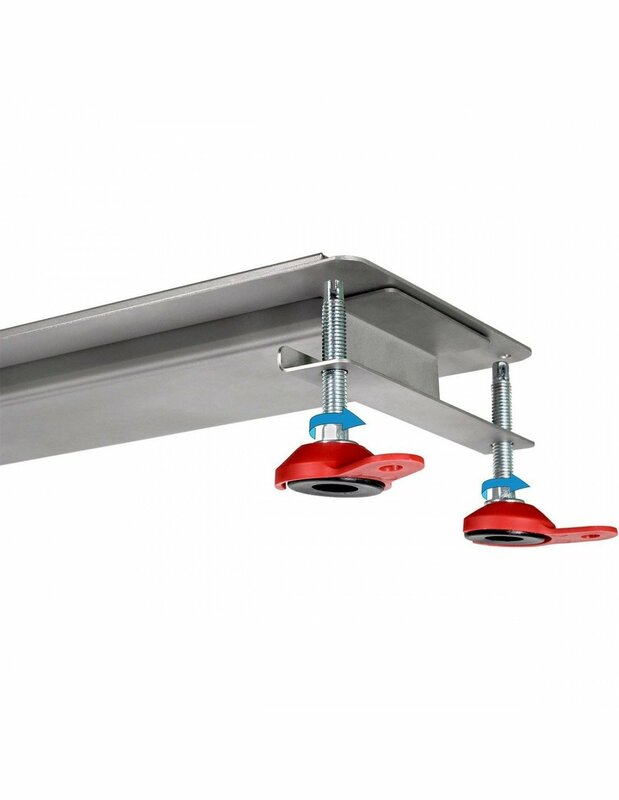 Total width with insulating flange is 96 mm and total unit length 1140 mm. Convenient siphon trap with 38 l / min throughput is included to the unit. 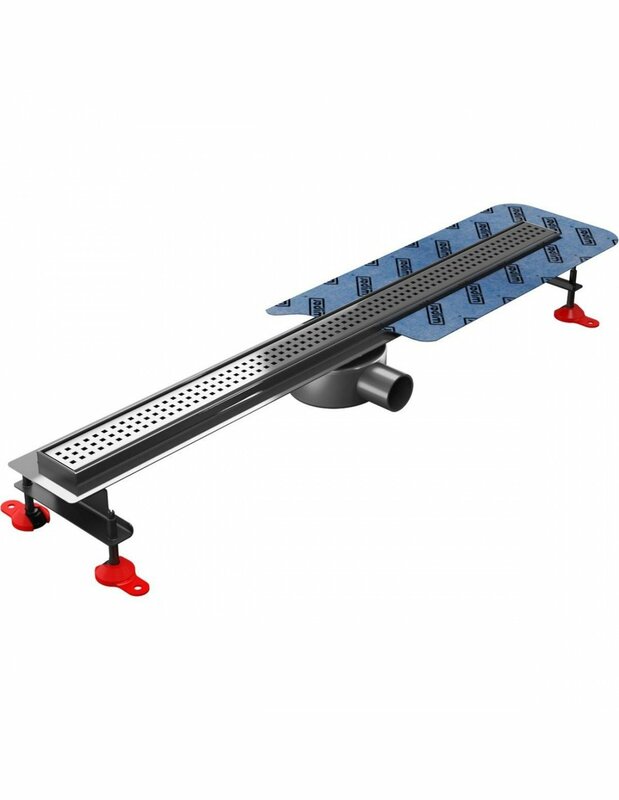 It's a unique Smart Trap solution, which provides 30 mm water seal with only 64 mm total drain height. It blocks the air from flowing back to the wet room. 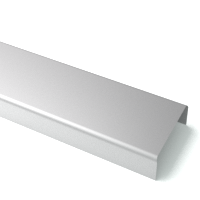 Outlet is centred, with pipe perpendicularly to gully length, it is 40 mm long and has diameter 40 mm with converted which allows it to be connected to 50 mm pipework as well. 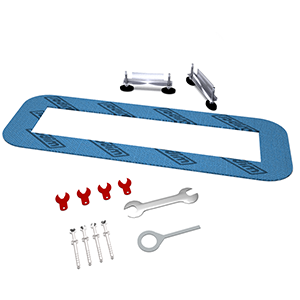 Waterproofing kit is used to seal shower tray as well as connections between walls and floor. It is recommended for concrete and mandatory for timber flooring. Each kit contains: 4kg tanking liquid, 1l primer, 10m sealing tape, 2 corners, 2 pipe collars. One kit covers 3 m² with 2 coats. If you buy it as addition to any drain or wet room kit You save £40 if you buy kit that covers 3 m² or £80 if buy one which covers 6 m². Basic product info and a link to a product will be sent to a person specified above. Where should we reply to? Enter valid reply email address. We will do our best to reply as fast as possible. 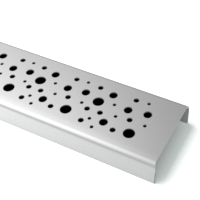 Main drainage part, stainless steel channel drain, 20 mm high, 58 mm wide. Outlet is welded to the channel, fixed in central position. 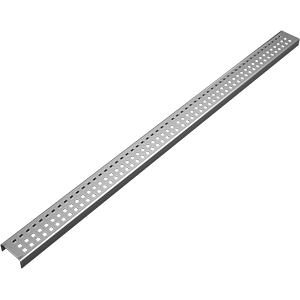 Drain is extended by steel flange on all four sides, 20 mm wide, important for insulation. Included by default. 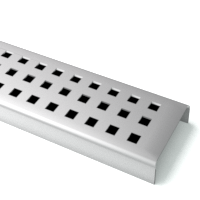 Brushed stainless steel grating, perforated with 3 rows of squares pattern. To clean the drain, you can lift it up. It's equipped with lifting hook which makes it easier. Included by default. Product is supplied as complete set. 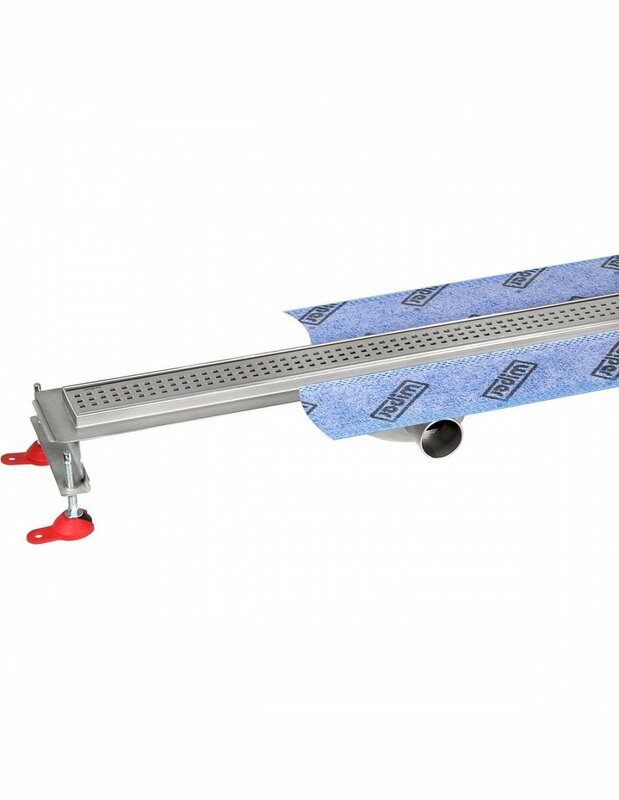 Adjustable feet are very helpful to position to drain at proper level and are easily removable. Sealing membrane is crucial to make the drain waterproof. Lifting hook for the grating and other fitting parts also in the package. Included by default. Set of sealing materials. Contains 4kg tanking paint, 1l primer, 10m sealing tape, 2 corners and 2 pipe collars. Handy solution to seal the tray and joints. Can be used to waterproof entire bathroom. Not included by default. The ISOL-ONE sealing mat is made from a polyethylene film coated with a special non-woven fabric on both sides, so that it bonds with the glue layer. Its installation is recommended in all areas that require sealing. 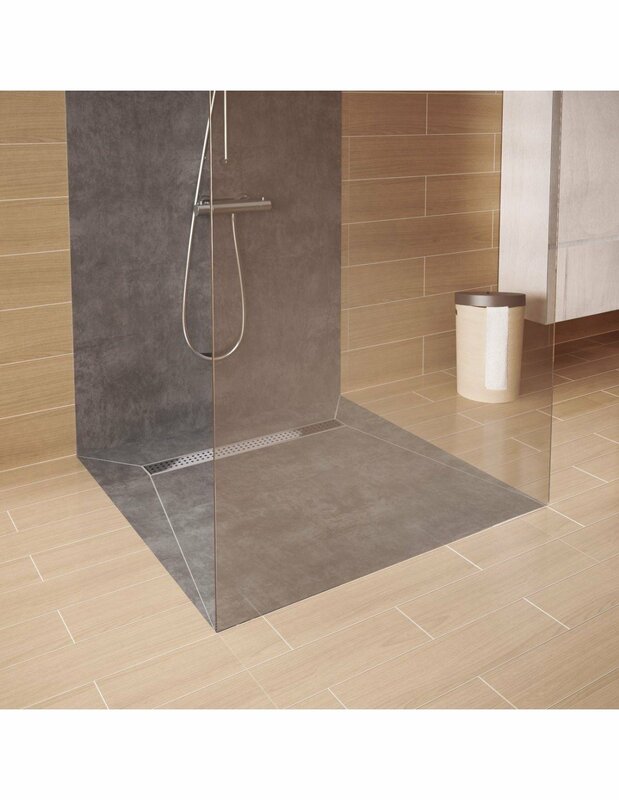 The mat is resistant to the cracking of the substrate, ensures the seal up of the entire surface, reduces installation time, allowing to lay the tiles immediately after gluing the mat. Adjustable feet are two small metal parts that can be connected to each channel end. They allow you to precisely set the unit height and level. Thanks to the red caps you can anchor the drain to the floor. 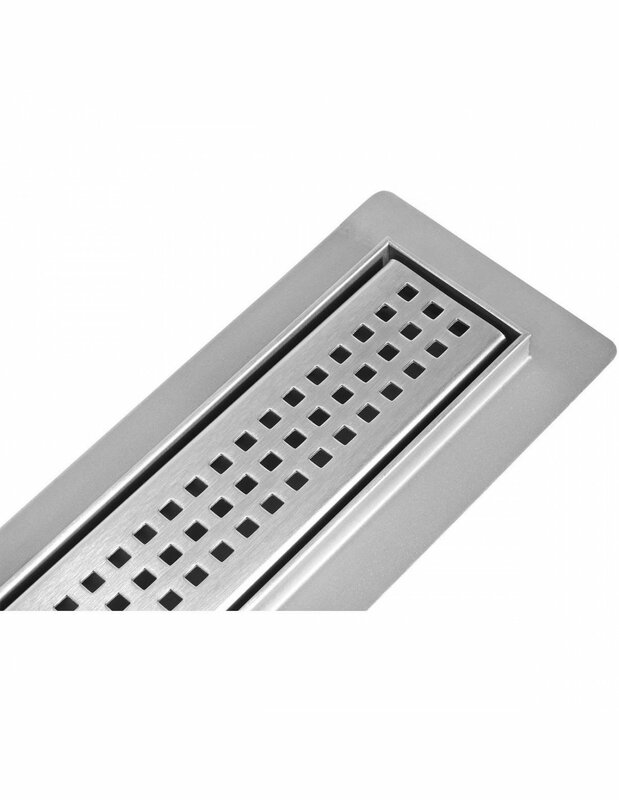 They are part of unit, included in price and always added to each drain. 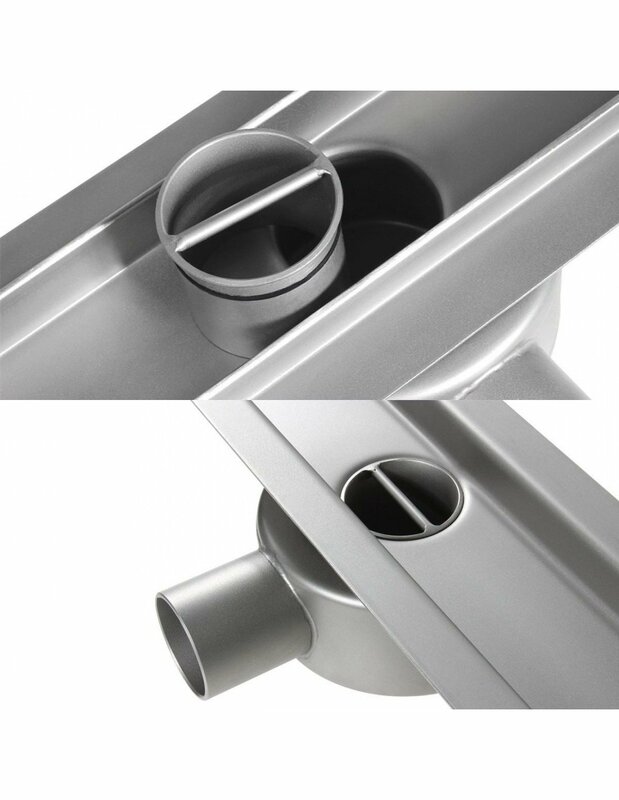 The drain includes a new patented SMART TRAP® stainless steel siphon with a capacity of 38 l/min and the Easy Clean system. 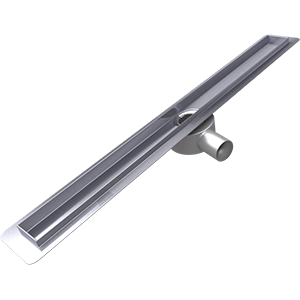 To clean it you can simply dismantle it from above when installed, and waterflow will remove any dirt. If not you can use chemicals. 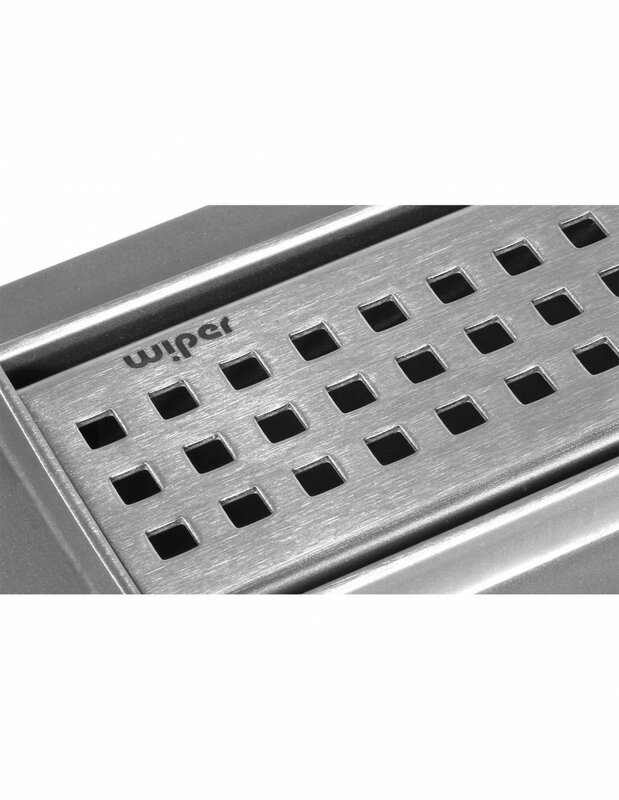 The waste trap provides Water Seal that prevents any bad smells to get back to your shower. Total siphon height: 50 mm. Caution. Please read the instructions carefully before installation. 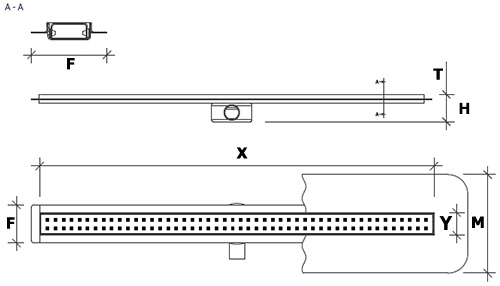 The diagram shows various parts of the channel and their dimensions can be found on the More info tab. 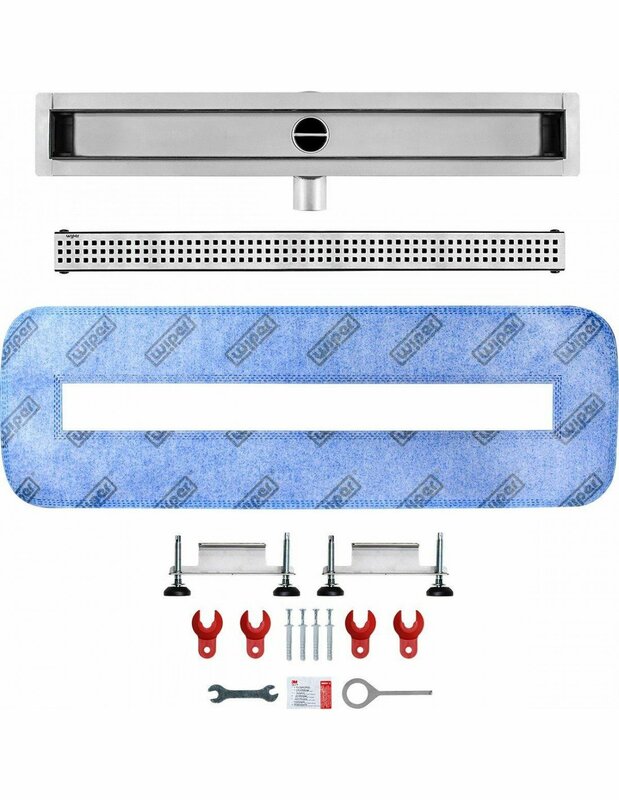 The instructions refer to the correct installation of the channel only and do not include information regarding insulation or other elements of the shower cabin such as sealing connections between the shower walls and floor as well as water proofing. The channel should be installed together with the siphon trap and then the adjustable legs should be glued in the places shown. 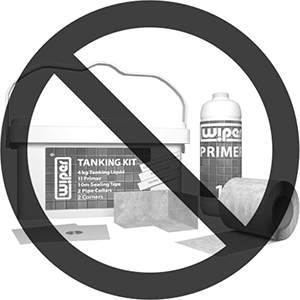 The tanking kit is a ready-mixed, under-tile tanking system to protect water sensitive substrates from exposure to water. 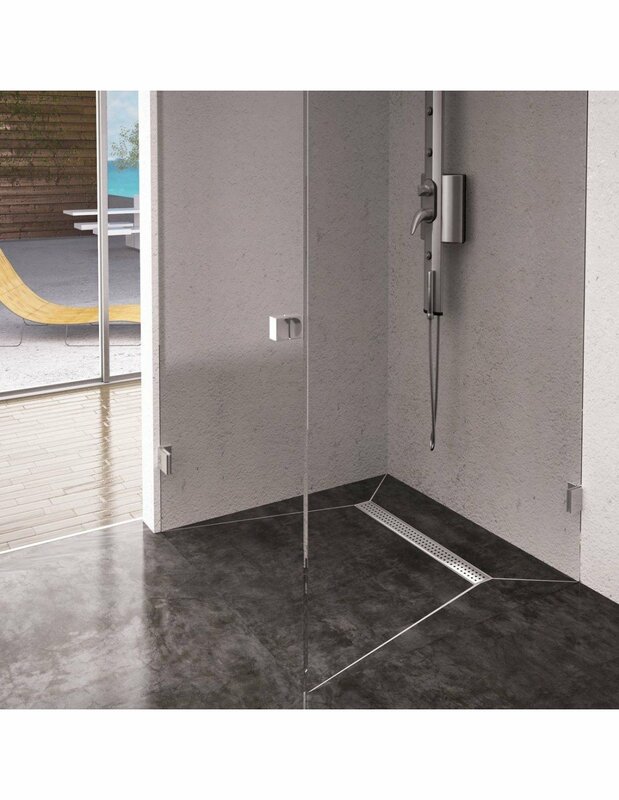 Suitable for wet areas such as bathrooms, showers in residential buildings, hotels, old people's homes and hospitals. Should not be used in places exposed to pressurised water, for an instance swimming pools. Ready to use, no mixing required and easy to apply with a roller. The kit includes a high performance joint reinforcing tape to protect against movement in floor joins and corners etc. The contents are all INSIDE the bucket and the contents are protected in the bucket with polystyrene infill's to stop transit damage.The instructions are printed on the rear of the tanking kit. 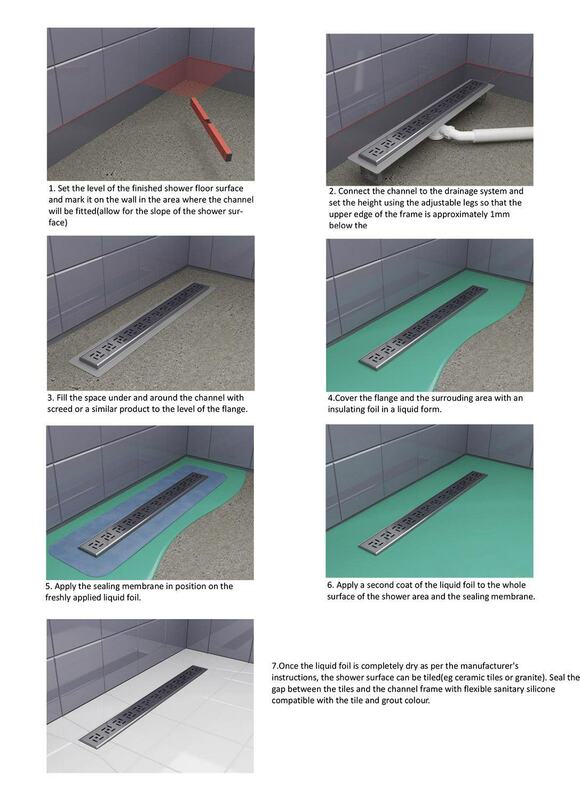 For anti-moisture insulation systems in wet rooms and rooms intended for human residence. The tanking liquid is a ready-to-use singlecomponent, solvent-free sealant composed of polymer dispersion, fillers and modifying additives. When applied to the surface, upon binding it creates a flexible and water-insulating layer. The tanking liquid is a ready to use, single component, solvent-free sealant mass, consisting of polymer dispersion, fillers and additives. When applied to a substrate and cured, it forms a flexible waterproofing coating. The product is intended for use inside places intended for human residence, especially in humid areas (such as bathrooms, kitchens, laundries), to perform insulation against moisture under linings and coverings, such as ceramic tiles, glazed tiles, terracotta, wooden floors and panels, and synthetic carpets. The product is intended for priming absorbent and porous surfaces, inside and outside buildings. It is especially recommended for cement - limestone plaster, gas concrete, plaster-carton boards and cement plaster. The primer has a high penetration ability, is deeply absorbed into the substrate, thus strengthening it, while allowing for „breathing”. These benefits improve the structure of the substrates, which, due to the passage of time, have lost their appropriate parameters. The priming solution improves adhesion to the surface of other materials that will be used on the primed substrate. By reducing the absorbency of the substrate, the wear of the applied coating materials, emulsion paints, glues, mineral putties reduces as well. The solution, due to the content of the biocide and fungicide, protects the primed substrate against the formation of mold and bacteria in the product. Documents available below are available to everybody for free to download. They can be open in high quality on your computer and be printed for further use. Is the product easy to fit? Which options should I choose? tester Be the first to write a review! Copyright © 2019 Wetrooms Design Ltd. All rights reserved. Chat started. Session ID: 1556193251. You are now connected to: David M.
If you see this it means that our Customer Service Agent is ready to help you. Ask about anything.